Elias Jengo lives in Kimara Stopover, an area on the outskirts of Dar es Salaam. On my first visit there, I brought two tubes of oil paint with me, one white and one black. He had called to let me know he was out of white and therefore stuck, unable to create the subtle shades and tones necessary for his works. He showed me into his studio, a large room filled with books on art and a wall covered in fading sepia photos of his family, stretching back more than half a century. Natural light from wide, open windows fell softly over his works-in-progress, giving the hues a warm glow that animated and gave them an inviting suppleness. The ochres and aquamarines that dominate his palette seemed to lack any sharp edges or heavy blocks of colour, only gentle shades like a lover’s skin, closely examined and lovingly beheld in morning light. Though we can get them in tubes of paint, true white and black do not exist in our world. Jengo knows this, and therefore his work possesses a confident and steadfast humility. His paintings express the loving but stern appraisal of one who is committed to even that which he critiques. In this varied collection, created throughout the course of a single year for his first solo exhibition in more than twenty, Jengo revisits the figurative approach of his earlier work and signature style — paintings with warm tones that are generous and full, welcoming and sincere. These images are affirmative, wise, and modest in their elegance. But Jengo also presents new works that show a captivating shift in direction toward abstract surrealism and symbolism with borders that are less determined and perhaps more critical, evocative of questions more so than answers. “The Forgotten Agenda” is a painfully-recognisable depiction of Dar es Salaam as it is experienced during floods in the rainy season. The work is pregnant with symbols. A pearly white orb shaped like an egg is torn open, spilling what looks like blood and yolk — it seems to represent both life’s resilience and fragility. A hand clenched into a fist grips a carved wooden staff, potent with supernatural force. Water and fire and wood compete for dominance but none can gain the upper hand. Each year, there are dozens of deaths caused by the floods, always among the most vulnerable. The work is a reminder of their experience, exposing the hidden violence of a system values the lives of a few over the many. “Mawazo ya Vijiweni” (Thoughts of the Common Man) is a work that is at once surrealist and clear-sighted. It probes the (sub)conscious, inviting us into the complexity and sensitivity of the subject’s internal thoughts and perceptions. A cracked gourd spilling milk and a dripping water tap, pieces of rough wood, corrugated iron sheets and shards of glass or metal, cloud or smoke, the hint of a flame — contrasting materials of contemporary Tanzanian life make up the tableau. The fragmented elements are carefully balanced, arranged around an upturned face. Though the features are finely drawn, it is hard to say whether the person is a man or woman. S/he is a human being who navigates, creates, deconstructs, dreams, and endures a life shaped by the textures of the external world but filtered through the lens of the psyche. We are left to ponder what conclusions the protagonist draws from the thoughts we see envisioned. 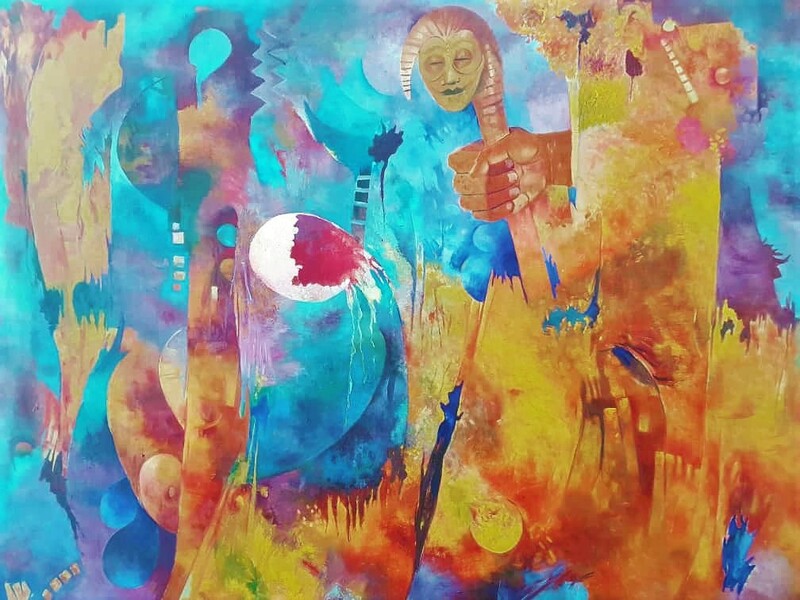 “Mawazo ya Vijiweni” is a distinctive example of how in works both abstract and figurative, Jengo centres the lives of his Tanzanian subjects, the people he loves, chides, knows, and shows his great respect for on every canvas. In “A Master Drummer”, Jengo remembers Moses Nyunyusa, a musician who could play ten drums at once and whose playing became the famous introduction to news programmes on Radio Tanzania Dar es Salaam (RTD) in the early days of Independence. “Mwanahiti” depicts a respected elder passing her wisdom on to two younger women using a traditional wooden fertility doll. All of the works in the exhibition — those mentioned before as well as “Entrepreneurs III”, “Musicians”, “A Happy Couple”, “Hair Plaiting”, and “The African Bride”— pay homage to the traditions, culture, and lives of “common” Tanzanians, who are portrayed with uncommon dignity, generosity, and affection. Elias Jengo was born in Tanga, Tanzania in 1936. He was educated at Makerere University (Uganda), Kent State (USA), and Sir George Williams University (Canada). With his contemporary and mentor Sam Ntiro, Professor Jengo co-founded the Department of Art, Music and Theatre at the University of Dar es Salaam (now called the Department of Creative Arts). He has now taught art there for more than 45 years. He is also a founder of the East Africa Art Biennale (EASTAFAB) and the founding Chairman of Nafasi Art Space. 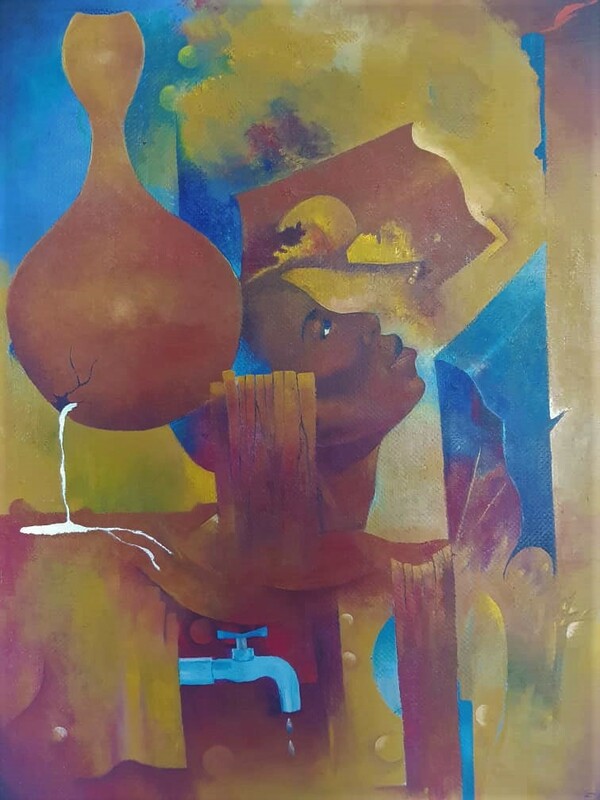 His work has been exhibited widely, in Tanzania, Zambia, Germany, Russia, Kenya, USA, Nigeria, the UK, Canada, Norway, Finland, South Africa, and more. He has created numerous large-scale public commissioned works around Tanzania.